In the fragmented coatings industry, Assovernici’s “Colore Sicuro” project has been created to promote the excellent member manufacturers, who share and support mutual values inspired by respect for their customers, for their products, society and the environment. Assovernici is the official competent association for Italian manufacturers of coatings. Its members include major brands in the industry. As one of its aims, the association promotes the use of high-quality coatings by consumers in order to encourage excellence in a particularly crowded and fragmented market. PRODUCT QUALITY – Absolute priority in declaring product performance certified by tests carried out in laboratories in compliance with national and international regulations. 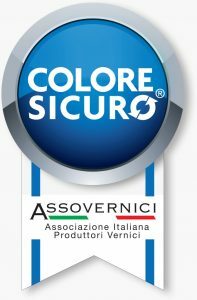 Arsonsisi has joined Assovernici’s “Colore Sicuro” project with its complete range of industrial coatings.